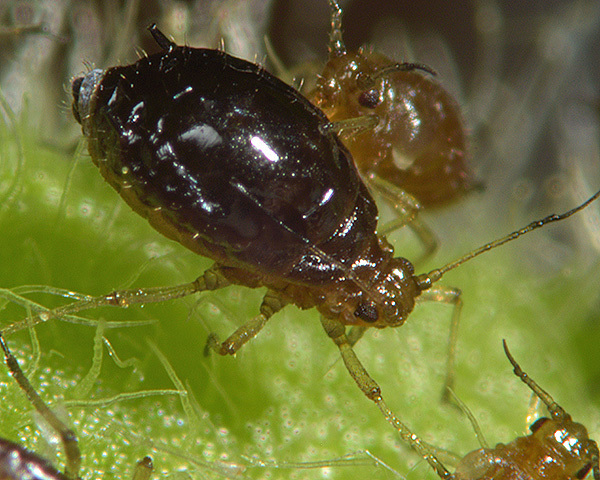 Brachycaudus are rather small to medium-sized aphids which are green, dark green or ochreous-reddish. They have very low antennal tubercles and their antennae are shorter than the body. 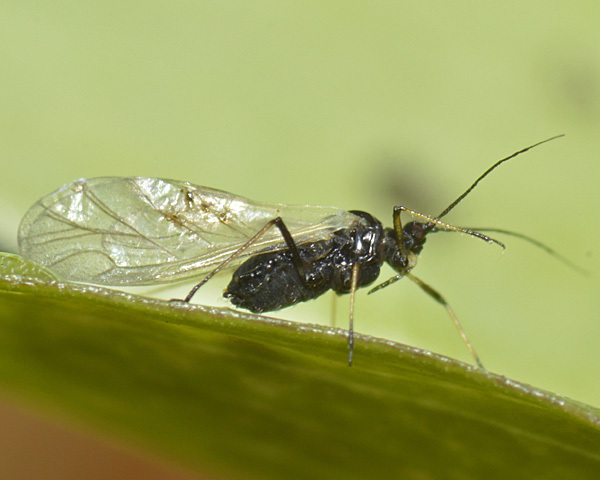 The terminal process of the last antennal segment is 3 or more times the basal part. The abdominal dorsum in apterous Brachycaudus is variably sclerotized, but frequently has an extensive dark sclerotic shield. Marginal tubercles are small or absent, and never on abdominal tergite 7. The siphunculi are short to moderate in length, nearly smooth, cylindrical or tapering, and distinctly flanged. The cauda is semicircular or helmet-shaped, shorter than its width, and with a slight basal constriction. Brachycaudus is a genus of 50 species found mainly in the Palearctic. About 14 species have plum (Prunus spp.) as the primary host. There are species groups associated with different secondary hosts - two of the most common species use daisies (Asteraceae). Other species do not host alternate, living year round on a variety of plant species. Some Brachycaudus species still have a sexual stage in their life cycle, but most do not. 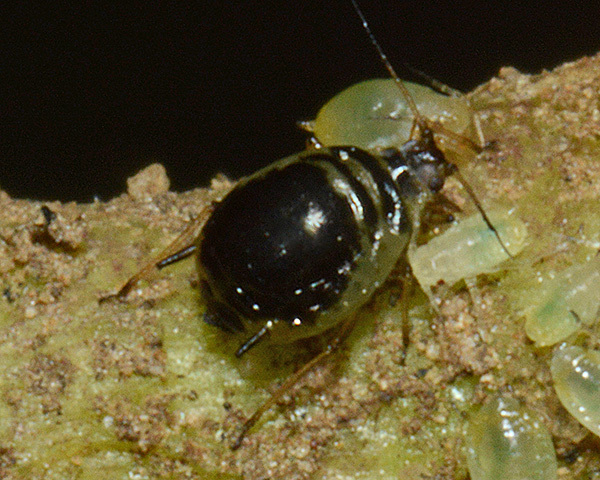 Brachycaudus aphids may be attended by ants. Some are important crop or fruit tree pests. Brachycaudus bicolor apterae (see first picture below) are shining yellowish tinged with pink, to pale green, with separate cross bars on thoracic segments, a variably developed black patch situated dorsally on the abdomen and 2 or 3 black stripes at the tip. The hairs on abdominal tergite 8 are 30-113 μm long, much longer than the dorsal hairs on more anterior segments. Brachycaudus bicolor has conspicuous flat marginal tubercles present on all segments from the pronotum to abdominal tergite 7, and spinal tubercles on the pronotum and abdominal tergites 7 and 8 (see). Their siphunculi may be pale, dusky or quite dark. The body length of apterous Brachycaudus bicolor is 2.1-2.4 mm. The alate (see second picture above) also has a variably developed black patch on the abdomen, and especially conspicuous marginal tubercles. She has 28-52 secondary rhinaria on antennal segment III, and 3-8 on segment IV. In Britain Brachycaudus bicolor is usually found in ant-attended colonies on root collars or at the bases of leaves of hound's tongue (Cynoglossum officinale). No sexual morphs have been recorded, and the species overwinters as parthenogenetic forms. Brachycaudus bicolor has been found in Britain, southern Europe, Egypt and parts of Asia. Brachycaudus cardui apterae (see first picture below) are brownish-yellow, pale green or brown, with separate cross bars on thoracic segments, a large shining black spot situated dorsally on the abdomen and 2 or 3 black stripes at the tip. The Brachycaudus cardui rostrum is long and reaches the hind coxae. The longest hairs on abdominal tergite 8 are 85-110 μm long, and the longest hairs on the hind femur are 40-80 μm long. (cf. the short-haired Brachycaudus lateralis. for which the longest hairs on abdominal tergite 8 are 20-61 μm long, and the longest hairs on the hind femur are 10-25 μm long. ) Their siphunculi are black, thick and cylindrical and 1.7-3.4 times the length of their cauda. 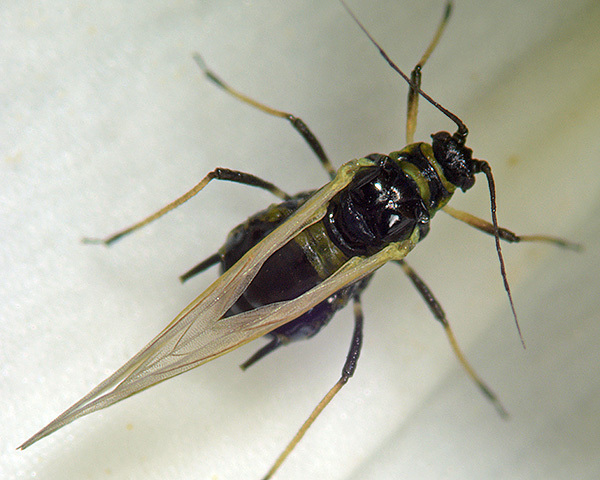 The body length of apterae is 1.8-2.4 mm. The alate Brachycaudus cardui (see second picture above) has a large black patch on the dorsal abdomen. Immatures are greenish or reddish. In continental Europe Brachycaudus cardui host alternates between various Prunus species, mainly cherry, plum and apricot, and various wild and cultivated daisies (Asteraceae) especially thistle (Carduus and Cirsium spp.) and borage (Boraginaceae). In Britain it seems to live all year round on Asteraceae. Infested leaves undergo severe curling. Dense colonies occur at the base of flower heads and on the leaves. A return migration to primary hosts occurs in autumn. 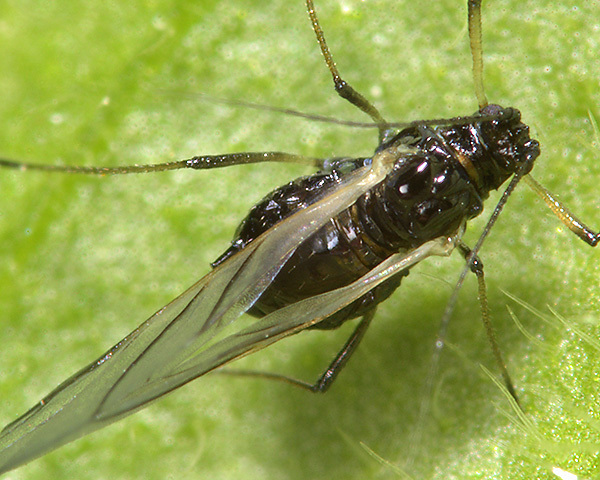 The plum-thistle aphid is found throughout Britain and Europe as well as in Asia, north Africa and North America. 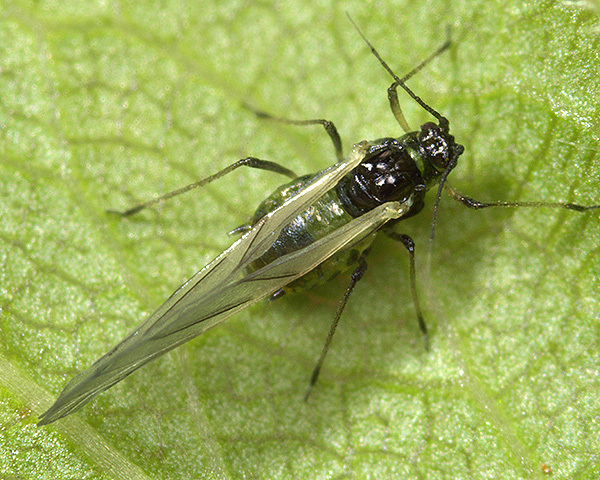 The adult aptera of Brachycaudus helichrysi (see first picture below) is variable in colour, ranging from yellow to green to pink to white, often shiny with a slight wax dusting. Their antennae are shorter than the body with dusky tips. The dorsum of the abdomen is without a black shield. Their siphunculi are pale, tapered and short - 0.8-2.0 times the length of the cauda. The cauda is pale, short and blunt. The body length of Brachycaudus helichrysi apterae is 0.9 - 2.0mm. The alate Brachycaudus helichrysi (see second picture above) has a dark dorsal abdominal patch, with 13-46 secondary rhinaria on the third antennal segment and 0-18 on the fourth. 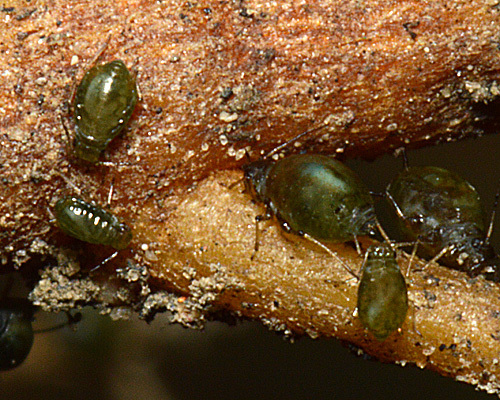 The leaf-curling plum aphid host alternates between various plum (Prunus) species (especially domestic plum and blackthorn) and a wide range of Asteraceae such as asters, chrysanthemums, yarrow and groundsel. Brachycaudus helichrysi populations on red clover (Trifolium pratense) have been called var warei, but are not thought sufficiently distinct to warrant subspecific status. This aphid is a serious pest on fruit trees causing the leaves to roll up tightly perpendicular to their mid-rib (see second picture above). Brachycaudus lateralis apterae (see first picture below) are green or reddish, with separate cross bars on thoracic segments, a large shining black spot situated dorsally on the abdomen and 2 or 3 black stripes at the tip. The rostrum is long and reaches the hind coxae. The longest hairs on abdominal tergite 8 are 20-61 µm long, and the longest hairs on the hind femur are 10-25 μm long (cf. the closely related Brachycaudus cardui for which the longest hairs on abdominal tergite 8 are 85-110 μm long, and the longest hairs on the hind femur are 40-80 μm long). Their siphunculi are black, thick and cylindrical and 2.3-3.4 times the length of the cauda. The body length of apterae of Brachycaudus lateralis is 1.6-2.6 mm. Note: the results of recent DNA studies suggest that Brachycaudus lateralis should only be accorded subspecific status to Brachycaudus cardui. The alate female (not pictured) has a dorsal patch irregularly bordered, and partly broken into crossbars and smaller sclerites. There are 18-35 secondary rhinaria on antennal segment III, and none on segment IV. Immatures (see second picture above) often have reddish patches on a greenish background. The pictures below are micrographs of Brachycaudus lateralis in alcohol. The first is an adult aptera whilst the second shows the very short hairs on the femur. Brachycaudus lateralis is usually found close to the ground on the stems and leaves of numerous Asteraceae, including chamomile (Anthemis), thistles ( Carduus, Cirsium) and ragworts and groundsels (Senecio), where they are usually attended by ants which tent over the colony with soil particles. It usually remains on Asteraceae all year, although it has been recorded host alternating to plum (Prunus). Brachycaudus lateralis is found over most of Europe. 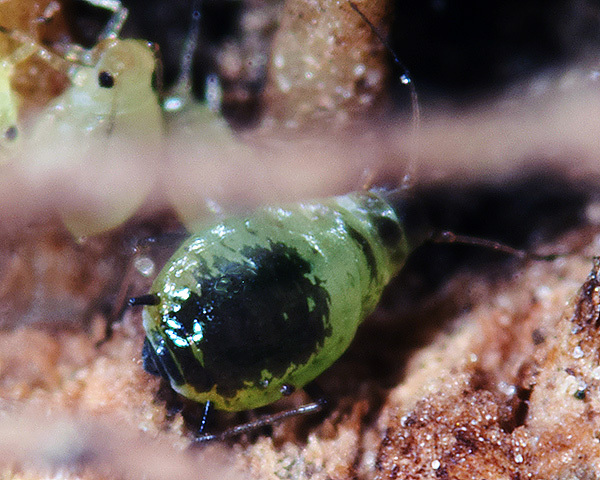 Adult apterae of Brachycaudus linariae are deep blackish shiny green. The last two fused rostral segments range in length from 0.135 to 0.160 mm. There are medium to large flat marginal tubercles on the pronotum and on some or all of abdominal tergites 1-5. The body length of adult Brachycaudus linariae apterae is 1.4-1.9 mm. Brachycaudus linariae alatae have 11-33 secondary rhinaria on the third antennal segment, 6-9 on the fourth segment and 0-2 on the fifth segment. Immatures are a somewhat paler green. 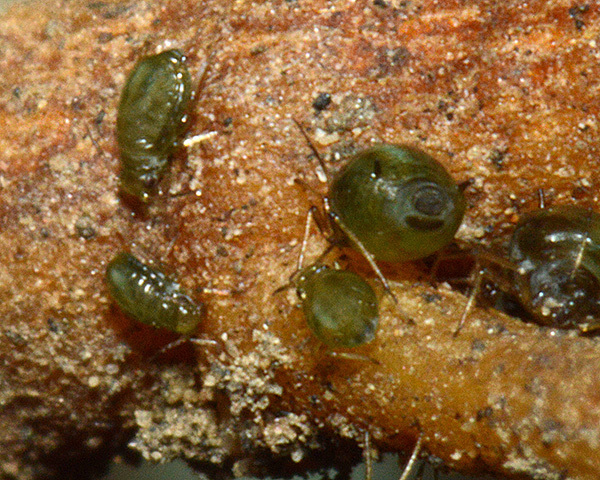 Toadflax aphids live on the basal parts of toadflax, especially yellow toadflax (Linaria vulgaris). 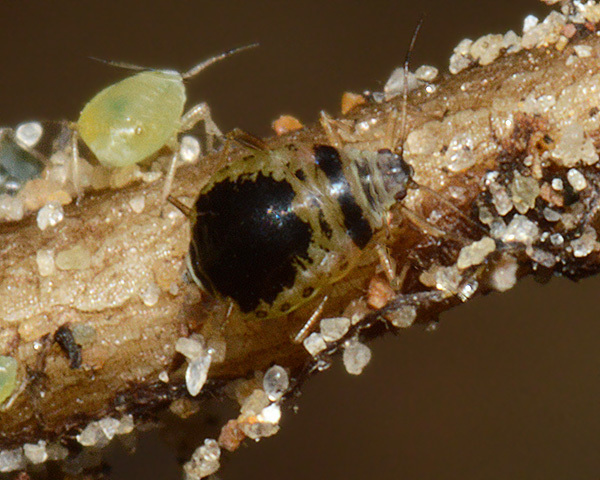 Sexual morphs of the toadflax aphid have not yet been found in UK, but have been recorded in Slovakia. Brachycaudus linariae is found in parts of western and northern Europe and most of eastern Europe. Adult apterae of Brachycaudus lucifugus are yellowish-green with dark cross bars on the pronotum and mesonotum, a transverse row of sclerites on the metanotum, and a shiny dark brown to black dorsal patch on abdominal segments 1-5. The patch frequently has pale windows or is broken into cross-bands. Abdominal tergite 8 bears 4 very short (less than 10 μm) hairs in a single row, like the dorsal hairs on more anterior segments. The black siphunculi are about double the length of the cauda. The cauda is rounded, as long as it is wide, with 6-9 hairs. 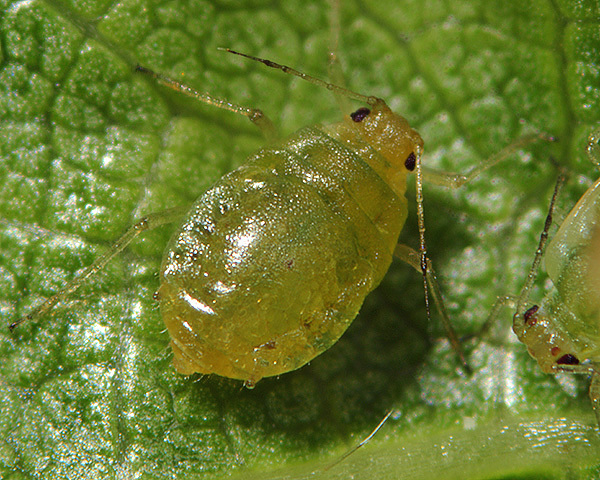 The body length of adult apterae is 1.4-2.0 mm. The alate of Brachycaudus lucifugus does not have broad cross bands or a large dark patch on the dorsal abdomen, but has transverse bars on tergites 7 and 8 with rarely a few sclerotic spots forming lines on tergites 4-6 only. 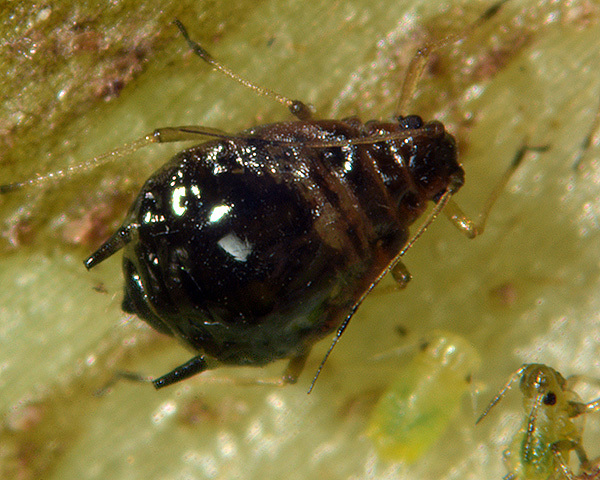 The short-tailed plantain aphid lives on roots, and root collar, and at the leaf bases of ribwort plantain (Plantago lanceolata). There is no host alternation. Brachycaudus lucifugus is usually ant attended, as in the second picture above. 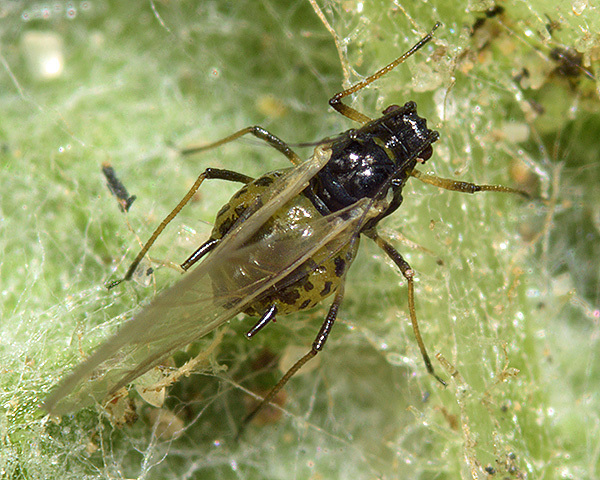 Oviparae and small apterous males can be found in autumn. In England it is restricted to southern counties. Elsewhere in Europe Brachycaudus lucifugus is known from Germany, Hungary, Italy, Poland and Switzerland. The dorsal abdomens of adult apterae of Brachycaudus lychnidis sp. grp. (Brachycaudus klugkisti and Brachycaudus lychnidis ss.) have an extensive solid shiny black shield (see first picture below) with the underside red-brown. Their median frontal tubercle is about as high as the antennal tubercles. Their antennae are 0.6-0.8 of the body length. Their legs have the fore femora pale with dorsally dark apex; the hind femora are dusky with a pale base and the tibiae are pale with the apex and base dark. Their siphunculi are dark truncated conical, and are 1.2-2.3 times the length of the cauda. The cauda is rounded or semi-oval. They often have a wax ring around the terminal abdominal segments - this is not mentioned in the literature, presumably because such deposits are not apparent in prepared slide specimens. Brachycaudus lychnidis has 15-24 hairs on the third antennal segment, the longest of which are 32-53 µm long; the cauda is shorter than its basal width.. Adult apterae of Brachycaudus malvae are pale green with separate black cross bars on thoracic segments, and an extensive shining black sclerotic shield on the dorsum (cf. Brachycaudus helichrysi which has no dark sclerotization on the dorsum). 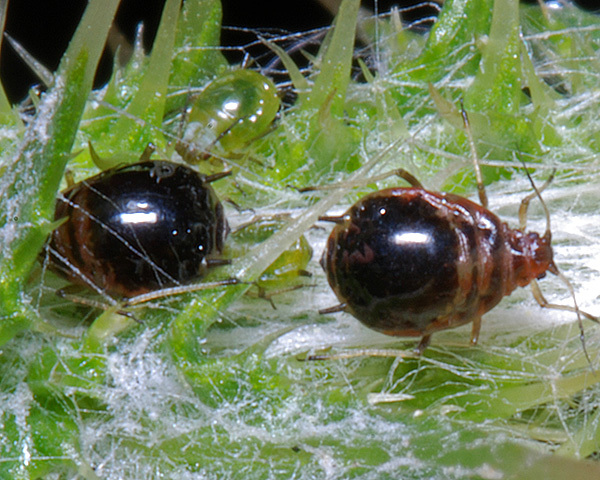 The hairs on the third antennal segment are very short, only 0.2-0.25 times the basal diameter of that segment. The last two fused apical rostral segments (RIV + V) are 0.165-0.190 mm in length. Marginal tubercles are often absent; if present they are usually only on the prothorax and abdominal tergites 2-4. Abdominal tergite 8 bears 10-14 short hairs, not in a single row. The siphunculi are black and cylindrical. The body length of Brachycaudus malvae apterae is 1.8-2.3 mm. Alatae have a large black dorsal patch may be broken up to a greater or lesser degree into transverse bars. Their antennae each bear 21-30 secondary rhinaria on segment III and 0-3 on segment IV. Brachycaudus malvae is closely related to Brachycaudus cardui and Brachycaudus lateralis in the subgenus Acaudus. Brachycaudus malvae lives all year feeding on mallow (Malva) species with no host alternation. 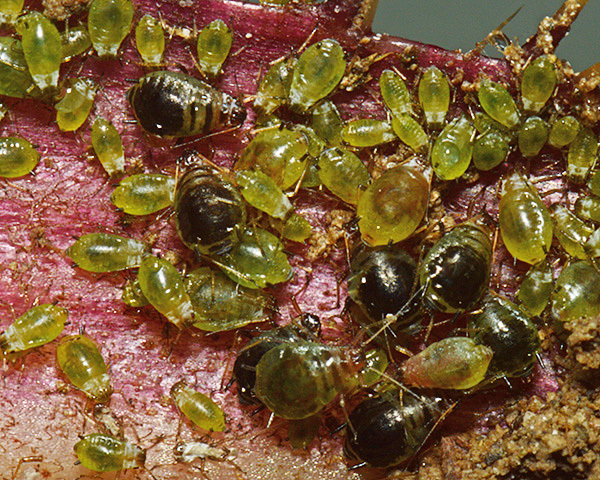 Aphid colonies are usually attended by ants. Sexual morphs have apparently not been described. The species is found in Britain, Spain, Italy, southern Russia, Ukraine and China (an odd distribution suggesting the species has been overlooked in many countries). Adult apterae of Brachycaudus persicae have a shiny sclerotized dark brown or black dorsum (see dark individual in first picture below). The fused apical rostral segments of the aptera are shorter than 0.175 mm in length. First tarsal segments are each with 2-3 hairs (cf. Brachycaudus schwartzi which has the first tarsal segments each with 4 hairs). The flanged siphunculi are black (cf. Myzus persicae which have pale siphunculi with darkened tips) and are more than 0.1 times the body length, clearly more than twice the length of the cauda and longer than the hind tarsi (cf. Brachycaudus schwartzi which has markedly shorter siphunculi). The cauda is dark, short and broad. 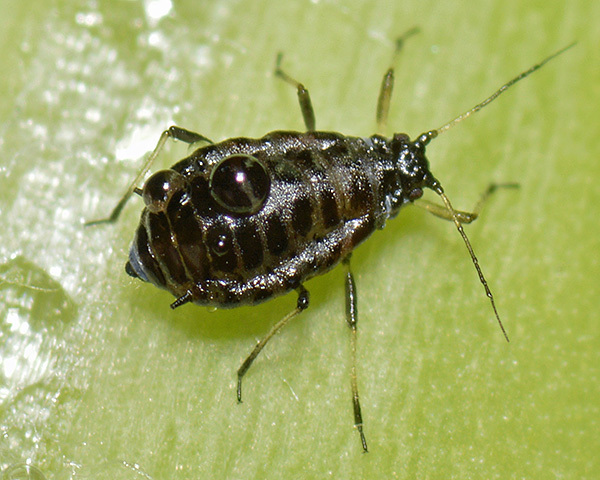 The body length of adult apterae is 1.5-2.2 mm. Winged spring migrants have similar coloration to the apterae, and have 23-51 secondary rhinaria on the third antennal segment, 9-21on the fourth, and 1-6 on the fifth. 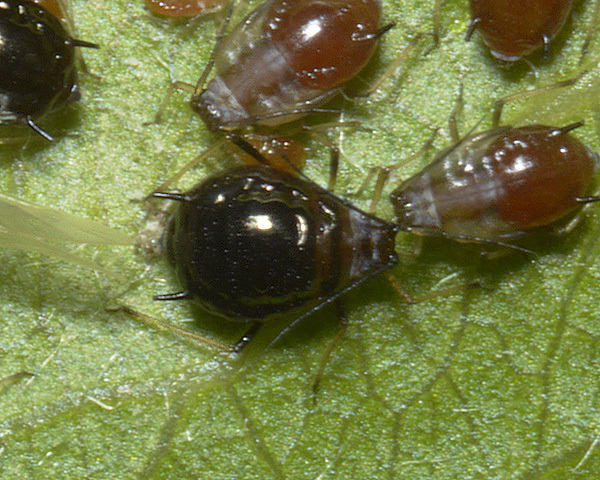 Immature stages of Brachycaudus persicae are yellowish to dark brown. 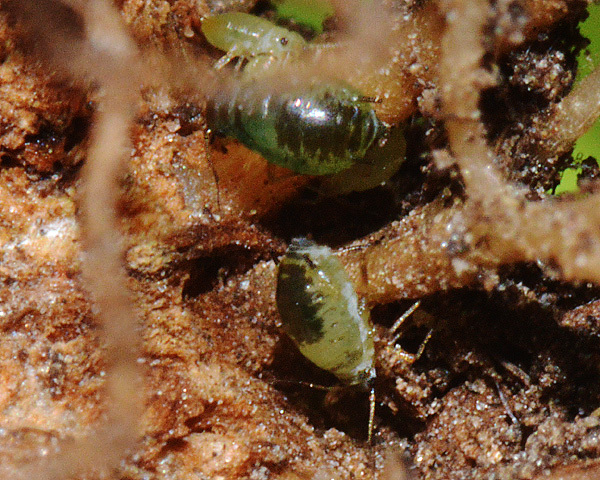 Brachycaudus persicae is most commonly found in large spring colonies on young stems of peach (Prunus persica) or apricot (Prunus armeniaca), often persisting into the summer on root suckers. In Europe there is some evidence of host alternation from Prunus to Orobanchaceae, but Brachycaudus persicae may remain all year on Prunus. 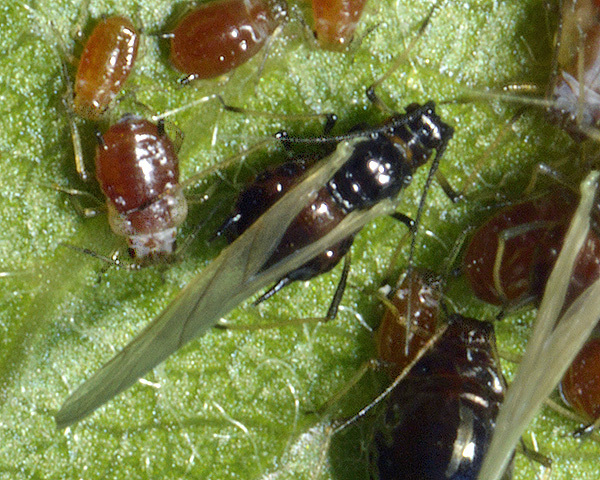 Aphids apparently of this species are also widely distributed on peach outside Europe, including the Middle East, southern Africa, Australia, New Zealand, and North and South America. The alate viviparous female (see second picture above) has some membranous intersegmental stripes or windows in the dorsal sclerotic area, and abdominal segment 4 has paired ventral spots much smaller than those on segments 5 and 6. 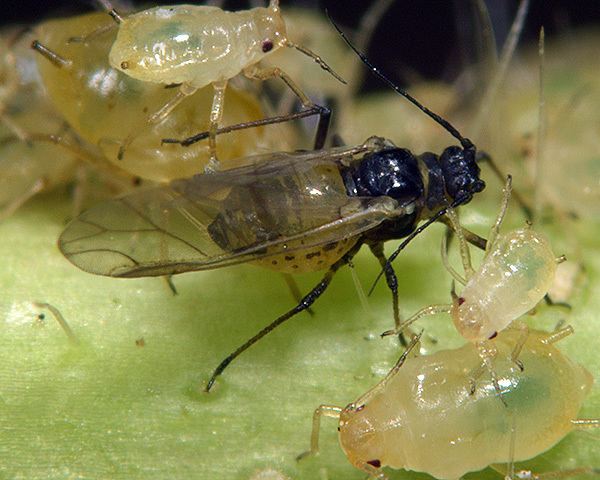 The extent of dorsal abdominal sclerotization on both the aptera and the alate is variable. Some are rather heavily sclerotized, whilst others are less so - especially anteriorly. Brachycaudus tragopogonis lives all year round on the stem and leaves of Tragopogon (goatsbeard) species with no host alternation. Oviparae and winged males appear in autumn. The species is found in southern Britain and over much of Europe, and has been introduced to South America.